CREATIVE NONFICTION BY CHARLES E.J. MOULTON "DEFENDER OF THE FAITH"
CHARLES E.J. MOULTON has been a stage performer since age eleven. His trilingual, artistic upbringing, as the son of Gun Kronzell and Herbert Moulton, lead to a hundred stage productions, countless cross-over concerts, work as a bandleader and as an acting teacher. He is a regular contributor for Idea Gems, has written for Shadows Express, Cover of Darkness, Vocal Images and Pill Hill Press. He is a tourguide, a big-band-vocalist, a filmmaker, a painter, a voice-over-speaker, a translator, is married and has a daughter. Charles E.J. Moulton's passion is creative versatility. My father Herbert Eyre Moulton (1927 - 2005) lost both his parents during that year of 1958. His father and my paternal grandfather Herbert Lewis Moulton, a World War I veteran whom everyone called Big Herb, died of a heart attack. After that, my father's mother must have been distraught. She got run over by a train on her way to work. This was a very poignant and very fitting for this feisty and strong Irish lady: she died standing up. It is then amazing to see how intellectual and calm my father seemed to be when he wrote the following piece for the Information Magazine in June of 1958. When his girlfriend died of cancer, my father, desperate and emotionally drained, left America on a two week vacation in his ancestrial home of Ireland. This stay lasted for seven years and brought him at least as much success as he the success he had experienced in the.United States. This stay eventually led him to Germany, where he met my mother, operatic mezzo-soprano Gun Kronzell. This is my father's article from June 1958. My mother Nell was an ardent Catholic all her life and something of a Revivalist at heart. She believed in standing up and being counted, and she never sat down again. That is why, whenever I read about the new look along the sawdust trail, I wonder what she'd have to say about it all. It's a cinch Nell wouldn't recognize the old Gospel Train in its Madison Avenue streamlining. She liked her religion straight, thank you, liked it as well as she liked a good fight. Come to think of it, her one encounter with militant unorthodoxy may have helped bring on the present era of soft voices and cushioned condemnation. Nell approached belief with wide open emotion and when said she'd gladly die for the faith, she meant it. To her as to many an Irishman the saints were cronies, especially the Blessed Virgin. Our Lady didn't live next door to us - she had moved right in to help with the housework. This Catholicism, however intense, was no impediment to respecting those outside the fold, providing they were sincere. Nell never condemned anybody - she loved them and felt sorry they were missing so much. As for prejudice, it was the Devil's work and anybody who practiced it was, in her own words, "a hypocritch of the first water." My father Big Herb had no official religious status, but he was better Catholic Dad than many in our parish, and his family was of vigorous if diverse Protestant stock. There were Presbyterians and Episcopalians and Transcendentalists and Free Thinkers and Swedenborgians and even a Quaker or two in the middle distance. Nell wanted me to know all about all these denominations, what made them "other" and how they got that way. We must have toured every church and temple in the vicinity, guided by astonished beadles, custodians and janitors. Nell always called these personages "dear", and made sure they locked up afterwards. Religious toleration didn't stop at the vestibule door. Everybody was welcome in our house. If they were atheists, if they didn't revere the Blessed Mother as Scripture says we should, if they were agnostic or fallen away or just indifferent, they were wrong and Nell never tired of belaboring the point. But as long as they were people and in our house, they got the full treatment, and even in the rockiest depression that meant anything from hot toddies and sherry-soaked fruitcake to a seven-course meal. It was during those hard days of the 30's that our bungalow began taking on the aspects of a soup kitchen. Impoverished spinsters with cats and cataracts, an artist on relief, a retired handyman named Peter the Indian, an unemployed barber (two bits for a kitchen haircut and I can still feel the pull of those hand clippers) - any number of down-and-outers crowded our table. None of them ever left without a shopping bag crammed with jars of jelly and fresh soup. No matter how bad things got, we were never of relief and they were, and that made all the difference. As long as there was a WPA, a PWA or any practical nursing to be done, Nell worked to help Big Herb while that gentle soul plugged away trying to sell insurance, appliances, anything to help supplement Big Herb's modest income. We always had more than enough, somehow. We had parties and battles and pets and a second-hand car born 1928, a Studebaker named Henrietta. We packed lunches and went off to the opera, the World's Fair, zoos, ballparks and museums. One weekend we started out for a short ride (we lived in a suburb of Chicago named Glen Ellyn) and ended up at Niagara Falls. Everybody cut corners and everybody had fun. Friday night we went to the movies, lured by Bank Nite, free dishes and good shows. Because prices changed from fifteen cents to a quarter at 6:15, people hurried through dinner and read the evening paper in their seats before the feature. Our milkman delivered his own vino with the dairy products. Big Herb continued to make home brew beer in the basement long after Repeal, and his men friends rolled their own cigarettes. The women knitted and crocheted, while the more ambitious hooked rugs or entered contests, did each others hair or tried their hand at short story writing. We kids gave puppet shows and pageants, fell out of tree-houses and fought. Saturday night there were crowds of poker players, not a one of them with a dime to his name, and during one slump when ours was the only house with the light and the gas still turned on, they carted home bushel baskets of coal to heat drafty old mansions left over from Palmier Days. We were the happiest people we knew. It was into this kingdom of raffish good will towards everybody that two woebegone missionaries wandered one rainy Saturday. Nowadays, as I said, gospel harvesters plow the fields and scatter with such gentility that you hardly know they're around. But a couple of decades ago you couldn't miss them. This particular brood barnstormed for the Lord in an antique limousine painted white and plastered with signs proclaiming the imminence of Kingdom Come. As if this weren't enough to scare the daylights out of anybody, a nest of loudspeakers topsides saturated the target area with glad tidings of approaching Armageddon, hellfire and judgment. "I'd like to know what these people think they're doing," Nell mused from the front window. "The man and woman in that goofy car. I've never laid eyes on them before, have you guys?" As usual I was presiding at a levée for urchins, all of us dressing up to play King, The Prince and the Pauper, or whatever we had seen at the Glen Theatre the week before. The evangelists didn't seem to be doing too well, according to Nell, who was never nosy unless something really special were afoot. They had tried every door on the street, finding nobody home (and everybody was) or getting a reception chilly enough to freeze Gehenna. "Well, I think it's just awful about those poor slobs," Nell worried. "The least somebody could do would be to ask them in, no matter what they're peddling." It never occurred to her that these might be religious rivals. She wouldn't have admitted the existence of any to begin with. "Come in, come in, and get dried off!" The Lost Sheep looked at her and then at each other. "Oh, come on. You look like the Grapes of Wrath." Nell was an inspired improviser. With one of her "non sequiturs" dropped casually into the conversational works, she could jangle all talk to a standstill, and her enthusiastic misquotations were worth their weight in double takes. Now was no exception. The Lost Sheep turned their unbelieving gaze back at her and beyond to the warmth of the house. Then they bolted inside where we could get a look at them. The man was gaunt and shaggy and he scowled all the time. The woman was wispy and chinless and very much ill-at-ease. There was something pathetic about them as they flapped their magazines our way. “Perhaps a spoonful of sugar,” the woman hesitated. “Lemon?” came the nervous suggestion. “Oh, skip it,” said Nell and she pottered out to the kitchen, abandoning us all to an eternity of embarrassment. Finally she returned with a loaded tray (and I choose the term “loaded” purposely). It was just like her to spike her teacup with a little something to take the chill off. Only with Nell you could never be quite sure. The female Sheep gasped like someone reviving after a near-drowning. “Have you found Christ?” she asked. “I never lost Him,” was Nell’s reply. The couple exchanged another look. The interview wasn’t going according to the book. “You see that picture over there?” My mother indicated a Raphael reproduction. “The ... that woman?” the female Sheep looked as though she were gnawing a quince instead of one of Nell’s delicious cookies. The Sheep set down their teacups and began a faltering pitch, but their hearts were not in it. “If it’s money you’re after,” Nell interrupted, “I don’t think there’s a nickle in this house.” She cast about for her pocket book and proceeded to empty it onto the coffee table. 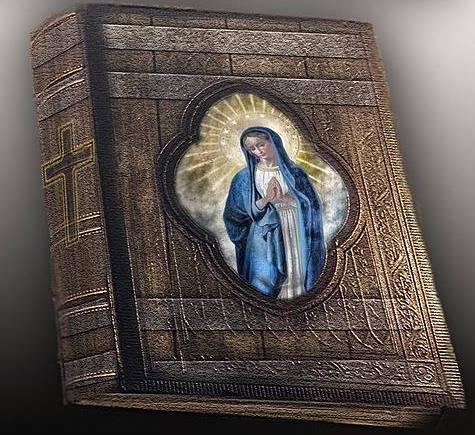 Rosary, Novena book, keys, family photographs, compact, comb and curlers, a jar of hand cream, a can of tooth powder and a denture brush, newspaper clippings, her lower plate, the dog’s collar and a bottle-opener all clattered forth. At each item the eyes of the Lost Sheep widened and their mouths contracted almost in disappearance. Now they both looked like they were sucking quinces, or possibly alum. No matter how many guests I rounded up, lunch was always hearty, generally consisting of baked potatoes, peanut butter sandwiches, junket or tapioca, baked apples and pitchers of milk or cocoa. Today it was further spiced with the novelty of the little morality play just acted out. “I can’t help it, Aunt Nell. It’s this silly magazine.” Irene was turning over the pages of one of the murky periodicals left by one of the Lost Sheep. We were all as entranced as kids today are with television. “Look, the Pope has three heads,” Irene put in. It was true. On the front page was a crude cartoon representing the Vatican with a hydra-headed monster oozing out, each head crowned with the Triple Tiara. “Let me see that!” Nell ordered. She took one look, then snatched up the remaining copies. As I recall it, they swam with lurid slanders against the church, the Papacy and Priesthood, the Holy Sacrifice of the Mass – against all things Catholic, in fact. Such exotic phrases as Whore of Babylon, and Pomps of the Devil, linger to this day. “Never mind them – come on!” By the time she reached her boiling point – which was notoriously low – we had cast off for uptown in Hernrietta. I doubt if any journey has ever been achieved in more portentous silence or with greater clugging or and motor sputter. We lurched, we skidded, we bounced over the tracks. Gears grated, people honked, and my mother’s knuckles grew white with clutching the steering wheel. We all knew exactly what was happening. We had seen it before and we knew. Nellie was on the warpath. Nobody said a word. It didn’t take long to find them. The limousine was a dead giveaway and you could hear the scratchy gospel hymns amplified all over town. They had set up shop right next to the bank and the female sheep was handing out literature while partner ranted from the running-board. Gus Niemetz the policeman stood by uneasily, not knowing what to do. The next instant a nuclear ball of Irish Catholic fury burst through the crowd, scattering umbrellas and shopping baskets like tenpins. The female Sheep spotted her but before she could sound the alarm, Nell was upon them, tugging the oracle down from his perch and shaking her fists in his face. I closed my eyes and put my head down on the back of the front seat. God help him, I thought. Heresy isn’t worth it. The scene was brief enough – more fistshaking and Gaelic oaths, propaganda dashed underfoot and appeals to the bewildered congregation, a convulsive digging into her own pockets by the chinless Sheep, then the bowling ball routine again, propelling Nell into the Studebaker and us on our way home. From the rear window we could see the limousine moving off in the opposite direction. Everything was. The Lost Sheep never came back, not in the limousine anyway. The eleven cents went into the Sunday collection and the Raphael Madonna was moved into a more prominent position over the fireplace. From then on Nell read every publication that came into the house. Religious toleration is a grand thing, she used to say, but it’s got to work both ways.